Water lilies are hardy or tropical. The differences are not only whether they will survive cold weather and come back the next season, but in color choices, scents and blooming time. Tropical lilies bloom in pink, white, yellow, blue and purple, are highly scented, and some varieties bloom at night. Hardy water lilies bloom only during the day and aren't scented. They come in pink, white and yellow. It is possible to grow both types under lights. Pack the net pot with damp soil made for aquatic plants or good garden soil that hasn't been recently fertilized. The soil should reach two-thirds of the way to the top of the pot. Place the water lily rhizome in the pot. The sprouting end should be above the soil and the rest of the rhizome covered with soil. Cover the top of the soil with pebbles to weigh it down. Place the tub in its permanent location. Adjust the grow lights so they shine on the tub. Exactly how far away the lights should be placed depends on the brand of lights and their wattage. Water lilies need four to six hours of direct light a day to bloom. They will continue to live if they get less. The grow lights will most likely have to be left on from 12 to 18 hours per day to mimic sunlight. Fill the tub with distilled or spring water. If you fill it with tap water, wait 24 hours before potting up the water lily and adding it. The chlorine will have evaporated by that time. Add the water lily. The top of the pot should be at least 12 inches underwater. It will bubble as it's submerged, until all the air in the soil has escaped. If the container is deeper than 12 inches, use bricks or a terracotta pot to bring the top of the water lily pot up to 12 inches below the surface. As the lily grows, remove the bricks or terracotta pot. Add an air bubbler to add oxygen to the water in the tank. You could also add an aquarium filter that works by sucking the water up and through the filter, and then back into the water from the top of the tank. 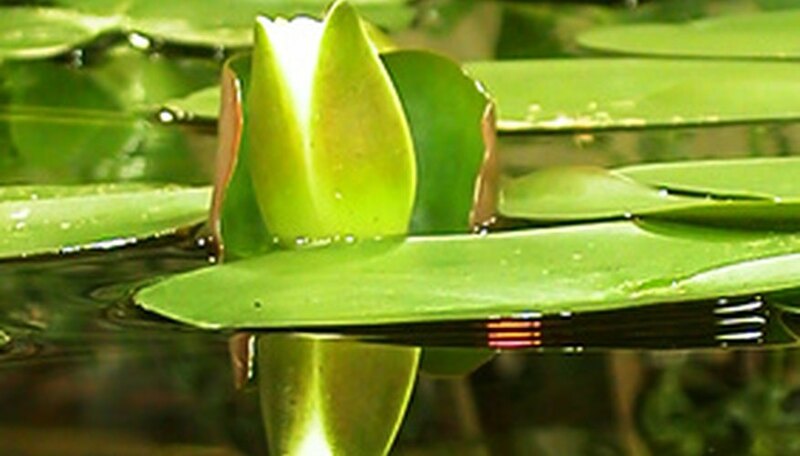 Adjust the lights closer if the water lily leaves are becoming smaller and smaller, or turning yellowish. If the tub is outside, add an aquarium water heater to keep the temperature around 70 degrees F.
Fasten the grow lights securely to a bench or wall above the tub so they don't fall in.